I don’t know why I keep buying highlighters. Now that I’m out of school I’ve got enough left to last the rest of my life. I’ve got enough highlighter ink left to refill my Platinum Preppy highlighters forever. In my work life I use highlighters to cross names off a list after I’ve written progress notes for the day. 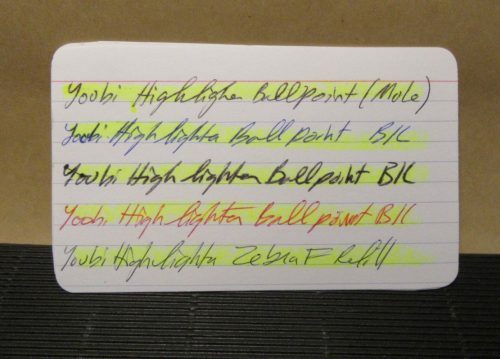 I use a highlighter because I still need to get info off the list when I’m done and transfer that to the progress note after it’s been printed. It’s a convoluted process that has to do with time constraints and access, or rather, lack of access to a computer for my work. I prefer crossing the names off the list to a check mark for visibility. 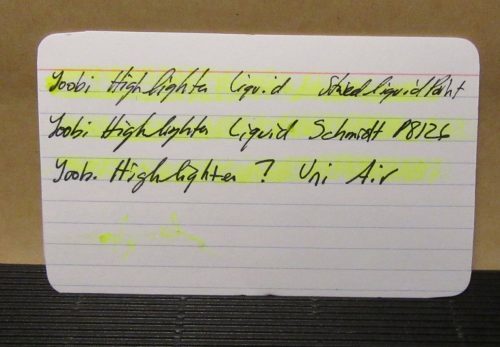 Even with this use, I’m SABLE on all my highlighters. I used the Sharpie gel highlighter, and like Dee I found it to be chunky and lackluster. 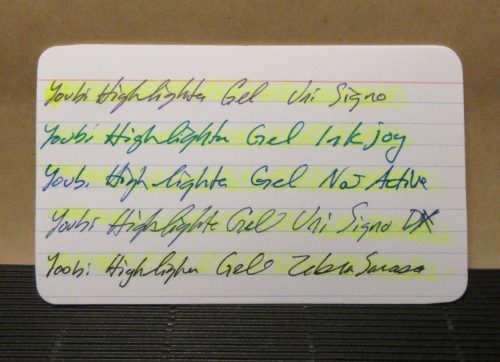 I don’t know what possessed me to buy the 4-pack of Yoobi gel highlighters. Hope? Stupidity? I dunno. At $4.50 they aren’t cheap, but I tossed them into my cart anyway. 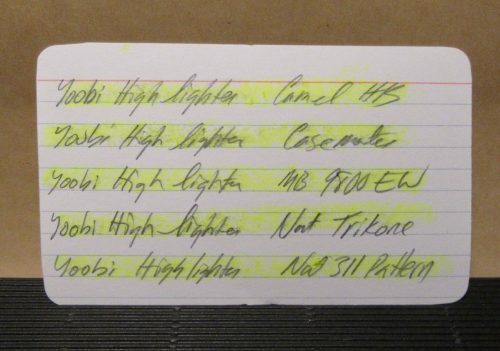 Each package contains green, yellow, orange, and pink neon highlighters. 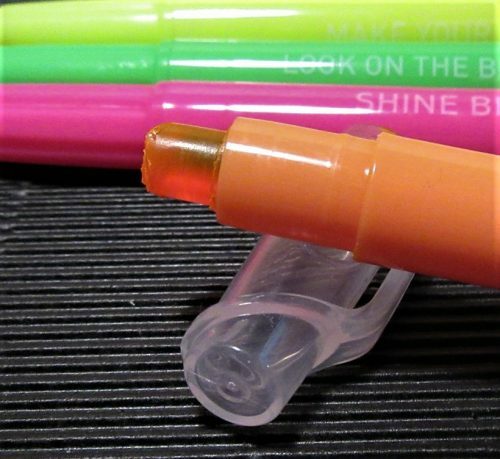 The highlighter is encased in a thick plastic roll up tube that reminds me of a glue stick and chapstick all in one. Each has a small clear cap with an integrated clip. The cap clips on and off securely and can be posted. When posted it’s only held on with friction but in my use it stays put. I tend to hold the cap in my hand anyway. The highlighter gel rolls up with ease, like any tube of chapstick, and each twist pushes up a decent amount of highlighter. 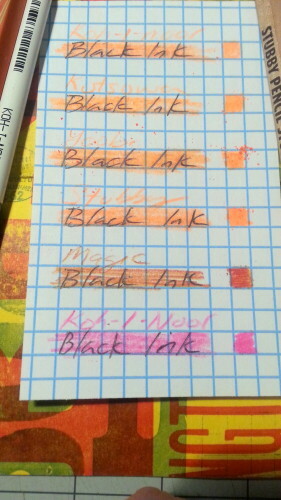 When first uncapped and in use the gel has a very strong odor, it reminds me of marker, or some fountain pen inks. I suspect that what I’m smelling is something to keep mold from growing on the exposed gelatinous ink bar. 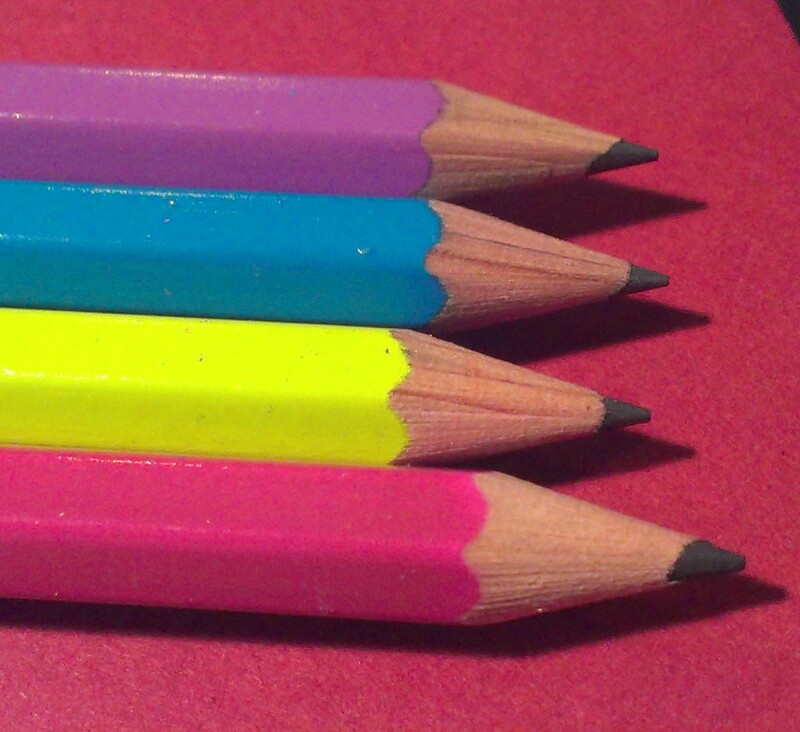 I’ve noticed this with Faber Castell Gelato crayons, though to a much lesser degree. I don’t find the smell off putting but know that others might. The highlighters are smooth and soft. They require the user to find the right amount of pressure without going overboard. Too little pressure and the gel doesn’t lay down enough and with too much, chunks break off. 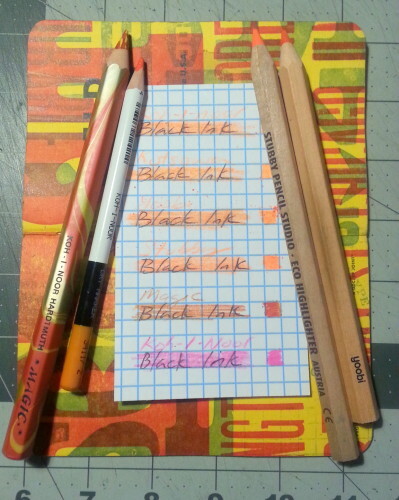 At first I didn’t like the rounded tip, but once I wore down a portion of the highlighter to the right angle it covered a line of text pretty perfectly and without needing additional passes. Though once I did get it to the proper angle I was more likely to break off a chunk with too much pressure. The highlighter does take some time to dry. If you get chunks of it on your page it can sort of glue pages together. On the rough cheap paper at work the Yoobi highlighter shines it takes less time to dry and the rough paper seems to help it need less pressure to lay down an adequate line. On the silky smooth paper in my StudioC notebook it took days for it to dry. It also had a tendency to bleed through. It doesn’t do this on the cheap paper. The StudioC paper is thin but my fountain pens don’t soak through. I have to wonder if this is due to the amount of time the gel ink takes to dry. 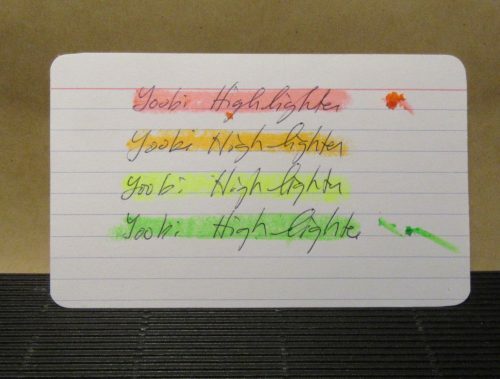 Either way, it’s worth noting that Yoobi gel highlighters work best on crappy paper. My final take on these? 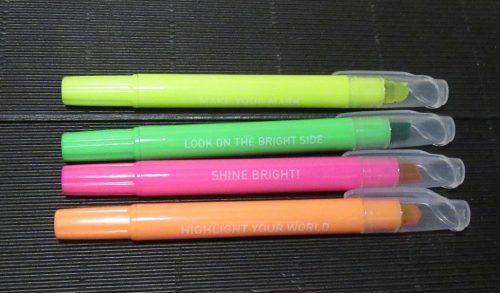 If you need to get a gel highlighter- because you forget to put the cap on your highlighter, or you don’t like ink getting everywhere, these are a better option than the Sharpie version. They are about the same price, are smoother and have cute sayings on the side of the body. 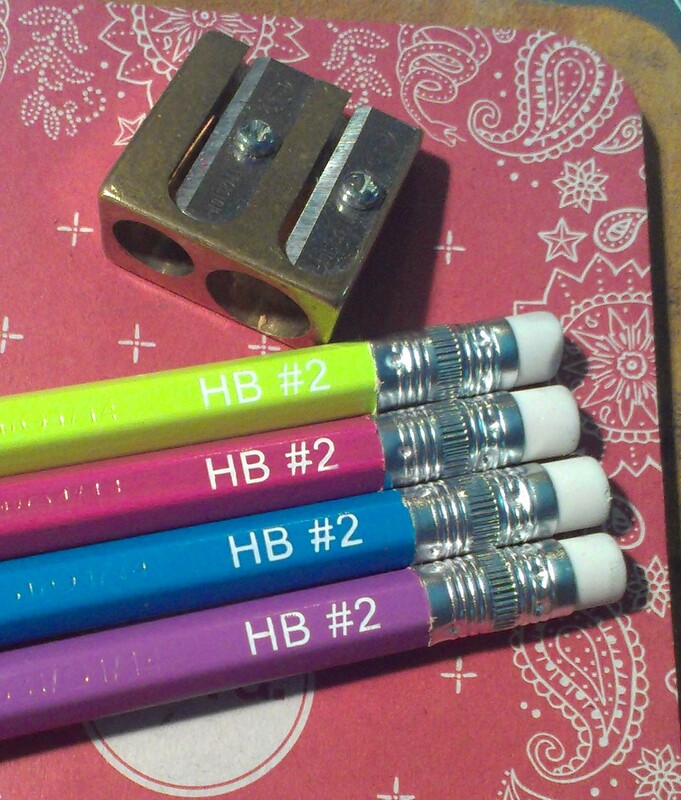 If you can control the pressure you use when highlighting, these aren’t bad. Don’t expect to use them on thin nice paper though- that’s where they will let you down. This entry was posted in Review and tagged gel highlighter, yoobi on 20171121 by leslie. Back to School Sales are irresistible. 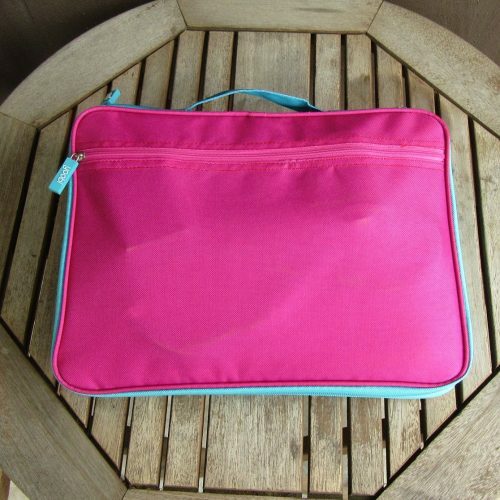 I end up picking up stuff I really have no interest or need for the Yoobi Document Organizer (YDO) is one of those things. The YDO is reminiscent of two very different products, but not exactly like either. 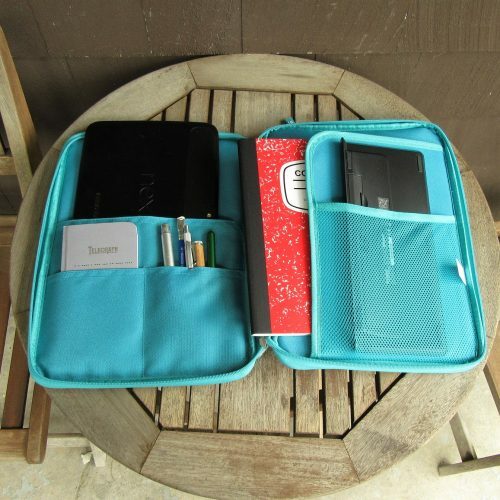 The first is a favorite of mine, the Lihit Labs Bag-in-Bag organizers. The YDO is close in size to the large. The other item it reminds me of, and you can thank Leadfast for the comparison, is the Nock Co Lanier. It’s not exactly like that either. I’ll get to those comparisons later. 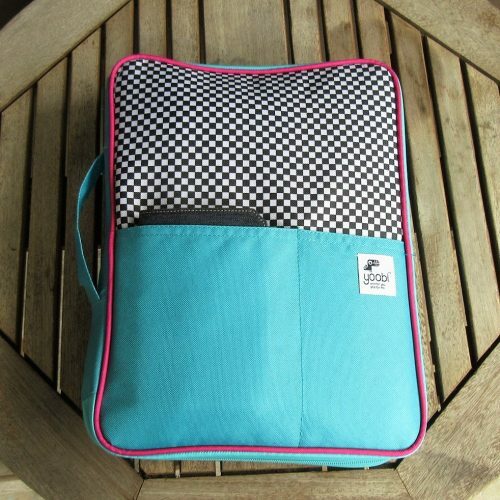 The YDO is available in 4 colorways- Goin’ Bananas, Aqua and Checks, Aqua and Black Dotty, and Yoobi Awesome. Aqua and checks is a bright shade of blue, while Aqua and Black Dotty is more of a seafoam green. Not at all aqua. There are also 2 different price points, which is weird. The Goin’ Bananas and Aqua and Checks are both $10 while the other two are $13. Why the price difference? The two higher priced YDO have velcro flaps on an inside pocket. I picked up the Aqua and Check because it was the only version my local Target had. If I’d had my choice I’d have gotten Goin’ Bananas. The quality of the stitching is acceptable, for a $10 item. If I had spent any more on this I’d take it back. There were a few loose threads here and there, that didn’t have an effect on the sturdiness of the item, so I hit them with a lighter and sealed them off. The zippers seem fairly sturdy but not as sturdy as say, a Tom Bihn bag. But then this isn’t intended to hold a backpack’s worth of stuff. Rather the YDO is intended to hold a few items in a well organized manner. The organization inside is simple. One large pocket, two smaller pockets, a mesh pocket, and a flap. The zipper unzips fully around three of the four sides. The remaining side holds a handle.On the outside there is a zipper pocket and two smaller pockets. The whole thing is just under 2 inches thick, 13.5 inches high, and 10 inches wide. 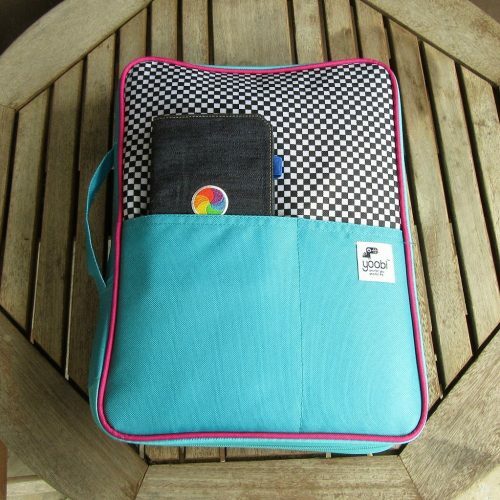 The polyester canvas slides in and out of my backpack and bags with ease. The handle is far from comfortable as it’s just a thin strap made of canvas. It’s also rather small. I can’t imagine carting the YDO around for more than a few minutes fully loaded. Speaking of fully loaded, this thing can hold a lot more stuff than I first thought. Loaded to comfortable non-bulging it holds the following: tablet w/case, BT keyboard, composition notebook, pocket notebook, handful of pens and pencils, earbuds, cord and one small charger. 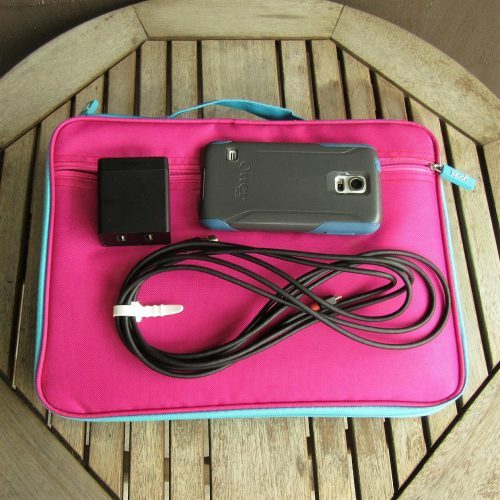 If I pack it to bulging I can add to the above a back up power source, another cable, my pocket notebook in case, phone, and my BT speaker. 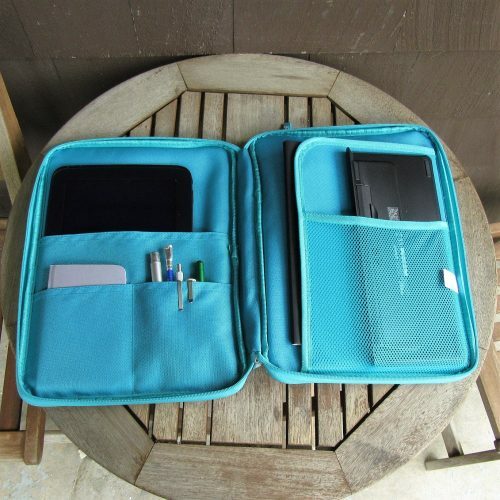 Either way, this is a decent amount of stuff if you want to use it to organize a specific set of tools for a specific purpose- like heading to the cafe to peck out your next novel without carting around a large backpack or messenger bag. If say I was heading into work and I knew I had a block of time where I wasn’t going to work but I could head to the cafe this would be a fast way to ditch my backpack and take only my tablet and keyboard with me. Also, I could see myself taking this with me on the weekend to the cafe. Or I could slip this into my backpack and have all my stuff ready to go in seconds. The big drawback to this is the lack of shoulder strap. I should weigh how much stuff I can cram into it, but at the end it’s heavy and if I were to cart it around by the strap, my fingers will go numb before I get to the cafe. Unlike the Lanier*, I don’t mind adding loops for a shoulder strap to this because I paid $10. If I look at this as a Bag-in-Bag contender the strap doesn’t matter. I guess if you wanted to back the Lanier and you want something similar at a budget price, this is a great alternative. Just don’t expect it to wear and last like a Nock product would. If you want a Bag-in-Bag at a budget price, this will do the job really well. Yeah some of the patterns are silly- but I kinda love the silliness of the bananas. Yoobi makes some silly products, but they are aimed at teens and fun loving adults. 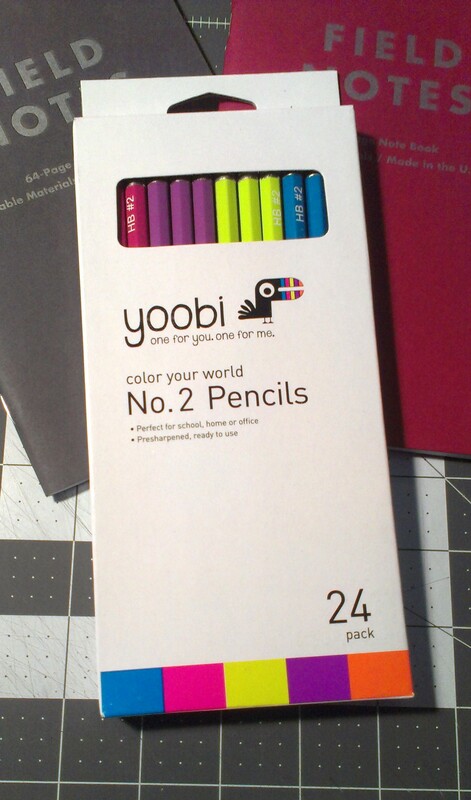 This entry was posted in Review and tagged organization on the cheap, yoobi on 20170808 by leslie. 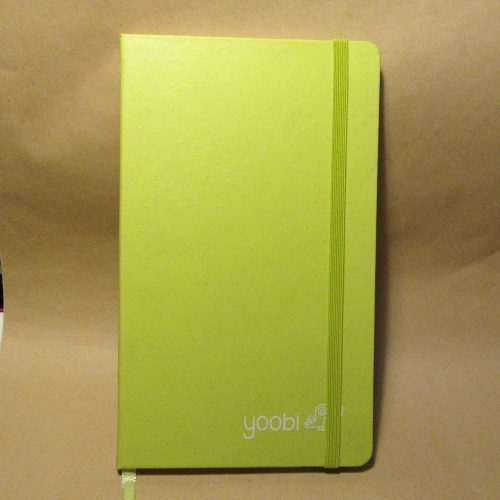 The Yoobi Journal is available in 2 sizes and styles: The vinyl covered 12.7×20.95cm or 5×8.25 inches which retail for $6 and the paper printed 8.5 x 6 inches and retails for $7. This review is for the vinyl covered version, though I’ve used both and the interior is the same. 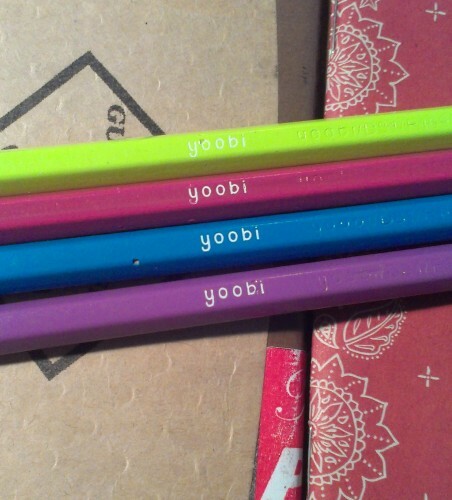 The Yoobi Journal is just another vinyl covered journal/notebook. It breaks no new ground in the category of Moleskine knock offs. It’s got a hard vinyl cover with matching elastic and generously long place marking ribbon. The ribbon is heat sealed to prevent fraying. The corners are rounded. 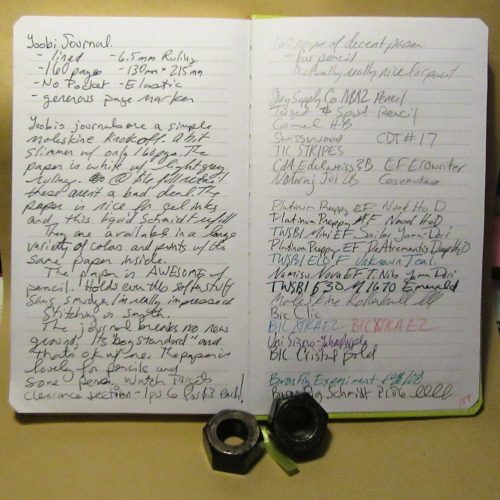 It lacks a pocket, but that is no big loss for a journal meant for writing. There is a 3mm overhang on all edges. They are available in a range of colors and prints- aqua, blue, pink, purple, white, and black. Sadly, they aren’t yet available in the new Yoobi color of coral. Inside is a book block that is smythe sewn. In some of the signatures there is glue creep along the stitching, but I’ve seen worse. It bears mentioning. There are 160 pages of off white paper. The lines are thin and gray. The ruling is 6.5mm and does not go to the edge of the page. 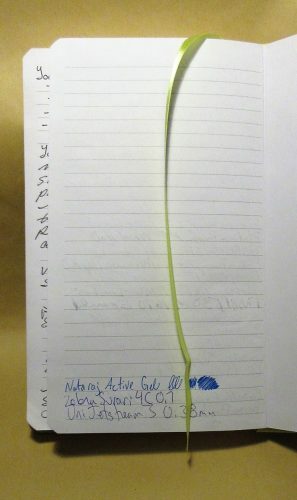 There is a 1cm gap around the page and a generous header..The color is pale enough to disappear behind my writing with most colors. If you’ve been reading this blog for awhile you know that this pleases me greatly. The paper is smooth but has enough tooth to be very nice with pencil. 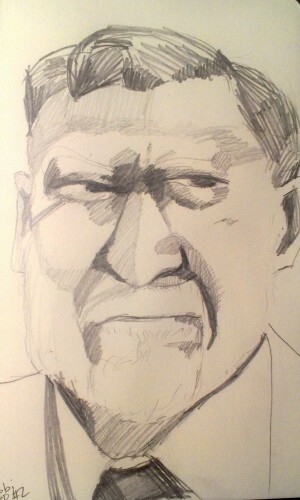 It does okay with extra fine and fine fountain pens, but those gushing mediums and broad nibs are going to soak through. The EF and F did have a tendency to show through but not bad enough to be a deal breaker. 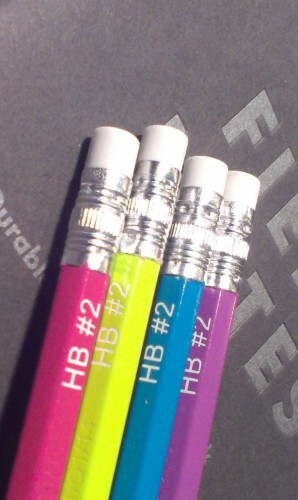 These really shine with pencil, rollerball, ballpoint, and gel inks. The cover is able to be folded over onto itself for writing in hand. The covers are stiff enough that this is comfortable. The notebook does lay flat on a desk even when first opened. It has the bonus of being inexpensive even at full retail. If you are patient, you will end up finding them on clearance for half price at Target or even the Yoobi website. I have picked up all of my Yoobi Journals for $3 each. This is a great value. This is a budget journal that is serviceable and tough. That vinyl cover stands up to abuse. I’ve been carting one around in my backpack and abusing it for months now and you’d barely notice the wear. This entry was posted in Review and tagged journal, yoobi on 20170629 by leslie.